Get out the black and orange yarn… Halloween is almost 2 weeks away! Try out some really easy, spooky spiders. I made “Gordon” and “Ramsay” during a Hell’s Kitchen commercial break – they’re so fast to make! 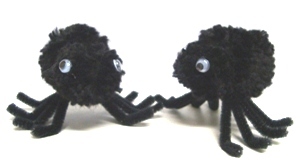 All you need are two pom pom makers of different sizes, black yarn, black pipe-cleaners, tiny googly eyes, and a hot glue gun. We have the pom pom makers and yarn, and you can find the rest at an art supply store. Drop by either store for a free pattern from our friends at N. Jefferson! This Harvest Pumpkin pattern from Marie Mayhew is great for making center-pieces and ornaments. Try making this pattern with Cascade 220, on 6.5mm needles. 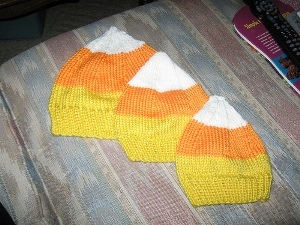 Want to make candy corn hats for the whole family? Check out this adorable pattern by Sarah Nopper. We suggest using either the Spud and Chloe Sweater or the Blue Sky Alpacas Organic Dyed Cotton. Both would make great, vibrant and warm hats! 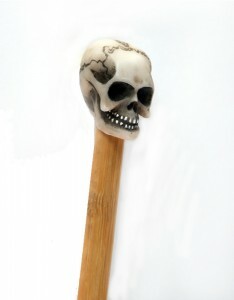 Limited quantities, so be sure to pick some up before it’s too late! This entry was posted on Wednesday, October 14th, 2009 at 7:28 pm	and is filed under Uncategorized. You can follow any responses to this entry through the RSS 2.0 feed. Both comments and pings are currently closed.